Toy Story- is a 1995 American computer-animated film, the first Disney/Pixar film to be made, as well as the first ever feature film to be made entirely with CGI. Toy Story follows a group of toys who pretend to be lifeless whenever humans are present, and focuses on Woody, a pull-string cowboy doll (Hanks), and Buzz Lightyear, an astronaut action figure (Allen). 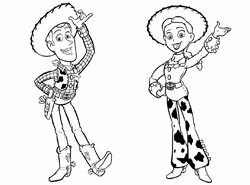 Woody, a pull-string cowboy doll, is the leader of a group of toys that belong to a boy named Andy Davis, and come to life whenever they want but chose to stay inanimate when humans are around. With his family moving to a new home and having a party, both one week before his birthday, the toys stage a reconnaissance mission to discover Andy's new presents. Andy receives a space ranger Buzz Lightyear action figure, whose impressive features soon see him replacing Woody as Andy's favorite toy. Woody is disappointed and resentful at his replacement, while Buzz does not understand that he is a toy, believing himself to be a real space ranger, and sees Woody as an interference in his mission to return to his "home planet". The toys later find out that Andy's next door neighbor, Sid Phillips, has been kicked out of summer camp and Rex, another of Andy's toys, explains to Buzz that Sid tortures and destroys toys just for fun. At Sid's house, the two desperately attempt to escape before Andy's family's moving day, encountering nightmarish hodge-podge toys of Sid's creation as well as Sid's vicious dog, Scud. Buzz sees a commercial for Buzz Lightyear action figures just like himself and realizes that he is a toy, becoming too depressed to participate in Woody's escape plan. Sid prepares to destroy Buzz by strapping him to a rocket, but is delayed by a thunderstorm. Woody convinces Buzz that life is worth living even if he is not a space ranger because of the joy he can bring to children. Buzz regains his spirit, but Sid takes him to his backyard. Cooperating with Sid's mutant toys, Woody stages a rescue of Buzz and scares Sid off by coming to life, telling him to "play nice" and not destroy his toys. However, the two miss Andy's car as it drives away to his new house. Running out on the road, they manage to climb onto the moving truck but Scud chases them and Buzz tackles the dog to save Woody. Woody attempts to rescue Buzz with Andy's RC but the other toys, who still distrust him, toss him off onto the road. Just then, Buzz rides up behind Woody on RC and they drive towards the truck. Spotting Woody driving RC back with Buzz alive, the other toys realize their mistake and try to help them into the truck. When RC's batteries become depleted, Woody ignites the rocket on Buzz's back and manages to throw RC into the moving truck just as the duo go soaring into the air. Buzz then opens his wings to cut himself free of the rocket moments before it explodes, and he and Woody drop safely through the car's open roof into a box on the rear seat. Andy looks in the box and is elated to find Buzz and Woody, who he assumes must have been there the whole time he thought they were lost.